A never-ending story in the field of tornado hazards is the miserable construction practices that characterize so much of American frame homes. They're mostly flimsy death traps to anyone experiencing a tornado, and it's shameful just how miserably shabby is the structural integrity of the typical American home, regardless of the price of the home. In the course of a FEMA-sponsored survey of building performance after the 3 May 1999 tornadoes in Oklahoma and Kansas, I was made aware of not only the inadequacy of homes built to local building codes, but also the massive large frequency of building code violations in American homes. Subsequent storm damage surveys have only served to reinforce those first perceptions. American frame home construction is shamefully weak! The standard building code in most of the tornado-prone areas of the USA is that the building be designed to have structural resistance to winds of up to 90 mph. In these areas, such a code is woefully inadequate for what they might experience. What makes this so egregious is that in hurricane-prone areas along the US coasts, the standard is much higher, and includes requirements for a number of specific enhancements to structural integrity that would be very much appropriate for tornado-prone areas, as well. Thus, we need only modify the building codes to match those of coastal areas vulnerable to hurricanes, and we will see a much greater resistance to tornadoes. Such enhancements would not make homes tornado-proof, but would certainly make them much more tornado-resistant. Most of the area along even a violent tornado path experiences less than EF-3 damage, so such an increase in structural integrity obviously would reduce damage along most of a violent tornado's path. And violent tornadoes are relatively rare. There would be a reduction in the amount of flying debris, which would in turn reduce the damage done by tornadoes. Of course, it's impractically expensive to retrofit existing homes to a higher building code standard, but at least we could mandate that new home construction should meet a higher standard. In time we would see a reduction in the damage done by tornadoes. This is not some wild dream, but is within our capabilities to afford and accomplish. The home builders will, of course, lobby to resist such a change, arguing that it would increase their costs, which they would have to pass on to their customers. Yes, of course, that's true - but what is the real cost of those enhancements to structural integrity? A few thousand dollars per home - amortized over the typical 30-year mortgage, this is a really small increase in the homeowner's monthly payment. There are other costs that homeowners might need to consider - for instance, more wind-resistant garage doors, and the installation of safe rooms. But these are choices that individual homeowners could choose or not. Everyone would benefit from higher standards of structural integrity over the long range. 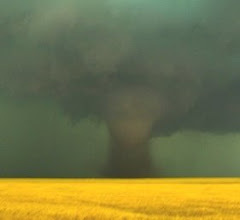 Unfortunately, given the low probability of any particular home being hit by the violent winds of a violent tornado, it would seem that investing even that modest amount may not be an economically viable decision. But if we have a goal of making our communities more hazardous weather-resistant, this is an essential component of that process. I haven't worked out all the details, but the cost to our nation of this vulnerability to natural weather hazards is not inconsequential - billion dollar tornadoes are not so easy to ignore. Why is the weather community not backing up a call for enhancing our building codes to reflect this reality? The American Meteorological Society, the National Center for Atmospheric Research, the National Science Foundation, etc. should be leading this effort! Weather people need to support this with their words and with their willingness to recommend the appropriate changes to the building codes. Another issue is the vulnerability of our children in schools. Recently there has been some effort to get funding to have a purpose-built tornado shelter in every school in Oklahoma. This strikes me as a bad idea, in part because many schools probably either already have an adequate shelter area or have an area that could be made adequate at relatively low cost. Putting a purpose-built shelter in every school is probably not a good idea - it makes sense only for those schools that have no possibility of an adequate shelter. What this requires is that knowledgeable people with appropriate expertise (structural engineers and meteorologists) should be working to do surveys of every local school to evaluate their tornado safety plans and their proposed sheltering locations. This could be done with volunteers from state and local sources, who would contribute their time and expertise to help schools develop practical solutions to the threat from hazardous weather. This also would be a process to enhance the weather hazard resistance of our cities and towns. The weather and structural engineering "communities" need to support this sort of collaboration to make the resistance of our cities and towns to hazardous weather a practical reality. I can't speak for the engineers, but I certainly think the whole notion of helping our nation be more "weather-ready" means that our weather professionals need to step up and volunteer to make this a reality!